Good looking for her age, this distinguished veteran fighter from the Duchy of Perun’s Daughter, has also spent many years adventuring before deciding to retire in the City of Zobeck. Her prowess and fame had her elected to the Council and she remains one of its most honourable figures. Azeleanara Perunisis is a highly influential noble in her own right, being not only the sister of Lynasha Perunisis, the Grand Paladin of the Order of the White Lions in the Duchy of Perun’s Daughter, but also due to her own exploits in the various wars of the Seven Kingdoms, notable battles against the Mharoti Empire in the border lands and famous legendary adventuring in the Southlands of Nuria Natal. 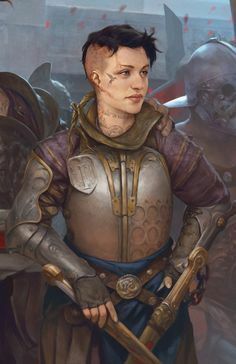 She lives in a fortified keep in the Citadel District of Zobeck and rarely wanders through lesser areas unless it be to attend important functions in the Merchant District or College District, or to attend significant religious ceremonies at the Church of Perun in the Temple District. She is a devout worshipper of Mavros-Perun, the God of War and Thunder, but channels her worship through the somewhat more wholesome teachings of his daughter and ruler of the Duchy where she was born. Azeleanara still visits the Duchy and is the main amabassador of Zobeck in that place. Every year she selects three of Zobeck’s finest young women to be taught at one of the many fine libraries and schools in the city of Sephaya, establishing these scholars in positions of power within the City of Zobeck. She is on good terms with everyone in the Council although does not completely trust all of them. She is the sponsor of Xavier’s sister, Zandramas Pendragon at a renowned college in Perunalia.